The Blue Diamond Stakes takes place over the weekend in Melbourne, with the most promising young and up and coming horses in Victoria playing it out for the state’s richest race for two year-olds under set weight conditions. 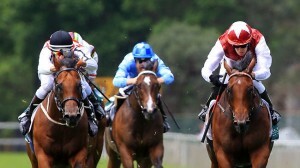 The race, run over 1200 metres, has a reputation for attracting promising juveniles and at the top of the list this year are Guelph, Miracles Of Life and Metastasio, with the early odds indicating the winner is likely to come from this trio. The best racebook to place a bet on the 2013 Blue Diamond Stakes is at Bet365.com, which is where the odds listed below for the race are taken from. Bet365.com is also offering each-way betting on the Blue Diamond Stakes, with which you will receive 1/4 if your selection places in position one to three. Unbeaten Guelph enters the race as slight favourite, ahead of Miracles Of Life. Guelph, the Blue Diamond Prelude winner, will have to overcome a tough draw after being placed in barrier 13, aware of the fact that only four of the last ten winners of this race have been the favourites. Experienced jockey Kerrin McEvoy stated that his decision to race with Guelph was based on the belief that Guelph could handle the high pressure of racing in the Blue Diamond. McEvoy left his decision late, but announced he would stay with Guelph rather than stablemate Metastasio, who goes into the race as the bookies’ third pick. McEvoy has already won the Blue Diamond on two occasions, most recently in 2011 with Sepoy. Trainer Peter Snowdend has declared himself delighted with the condition of his horses, and maintained that Guelph was the top pick. McEvoy believes that Miracles Of Life is the horse to beat, but maintains that it will be an open race. Miracles Of Life, also unbeaten in the three races it has run, seems to be the clear second pick and starts from barrier 1. The opening gate could be a tricky place to start the race from if Miracles Of Life doesn’t get off the blocks quickly. There have been no winners of the Blue Diamond coming from barriers 1, 2 or 3 in the last ten years. Metastasio comes into the race fresh from a victory in the Chairman Stakes, and Thermal Current placed third in the Blue Diamond Preview. These recent results are worth keeping in mind, as the last two winners of the Blue Diamond (Samaready in 2012 and Sepoy in 2011) have come from victories in the Blue Diamond Prelude and the Blue Diamond Preview respectively. The action takes place at 16:30 Sydney time, and Friday afternoon EST. As mentioned above, the best place to place bets on the Blue Diamond Stakes is Bet365.com. When visiting Bet365.com click ‘Horse Racing’ in the left sidebar and scroll down to the Antepost section of the page where you will find all the markets for the race. The Blue Diamond Stakes is the premier two-year-old sprint event of the autumn carnival in Melbourne and the race itself has produced many fine horses over the years. Sepoy (2011), Alinghi (2004), Bel Esprit (2002), Redoutes Choice (1999) Courtza (1989) and Zeditave (1988) have all won this race since its inception. First run in 1971, the Blue Diamond Stakes is now a $1,000,000 race for the best two-year-olds and Blue Diamond Day has grown to become the biggest race day of the autumn for the Melbourne Racing Club at Caulfield. Visit the Melbourne Racing Club website to keep up with the latest news and any further information on the event.